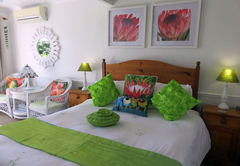 Cape Rose Cottage is a 4 star graded B&B with self catering option, offering Camps Bay accommodation for tourists and visitors of Cape Town. 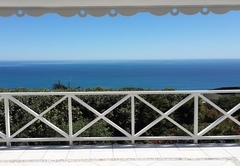 Cape Rose Cottage enjoys breathtaking views of the Atlantic Ocean and the most magnificent sunsets. 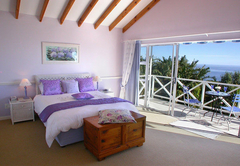 Nestled in a quiet and peaceful location under the Twelve Apostles, Pam and Steve invite you to enjoy their sincere hospitality and three beautiful luxurious and romantic suites which have been created for the discerning guest who appreciates attention to detail and something extra special. This warm and inviting home, with a wonderful ambience, is beautifully decorated and furnished. 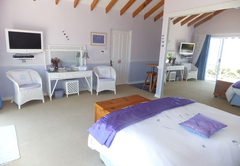 The 1st floor section of the house offers two self contained suites, the Lavender suite and the Aquamarine suite which each accommodate two people. The suites have a separate entrance and an adjoining lounge. The entire floor can be let as a penthouse (ideal for two couples traveling together) or the suites can be let individually. 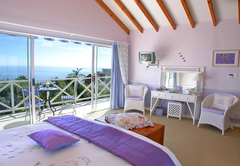 The beautifully furnished bedrooms, which have panoramic views of the Atlantic Ocean and the Twelve Apostles, are sunny and bright with mirrored wardrobes reflecting the sea. 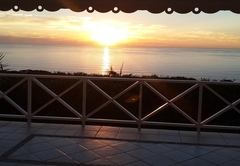 The wide sliding patio doors, which lead out on to your own private sea facing balcony, have a table and chairs where you can sit and enjoy the magnificent sunsets. Wake up to the sound of birdsong in the mornings from the garden down below. The ground floor offers the stunning Gardinia Studio which accommodates two people. It has a private entrance, a gorgeous double bedroom and sitting area with TV, DVD and mini Hi Fi. 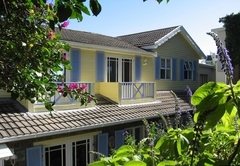 There is a sea view from the suite and patio which leads out onto the beautiful garden and solar heated swimming pool. Enjoy breakfast or sundowners in the privacy of your own secluded garden and patio whilst listening to the birdsong and revel in the peace and tranquility that this suite offers. 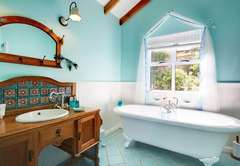 The Lavender and Aquamarine Suites each have Victorian styled bathrooms whilst the Gardinia Studio offers a modern styled bathroom with beautiful glass mosaics. 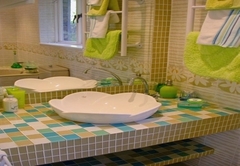 All bathrooms have a bath and shower and heated towel rails. 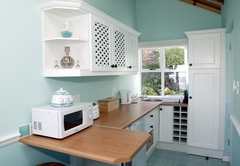 The kitchens all have quality units, crockery, cutlery and glassware and are fitted with Fridge, Microwave, Kettle, Toaster and Sandwich Toaster. Daily Housekeeping. 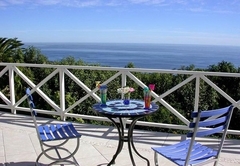 Enjoy a self serve Continental Breakfast on your own balcony overlooking the Atlantic Ocean. Your kitchenette is fully stocked with Breakfast cereals, yoghurt, tea, coffee, milk, sugar, juice, bread, butter, jams and cookies or a delicious continental platter can be served to your suite. The Lounge adjacent to the Lavender and Aquamarine Suites has breathtaking sea and mountain views and is furnished in beach house style with comfy sofas. It has a small library, Hi Fi and 'honesty' bar where you can sit and relax and enjoy a sundowner or two whilst admiring the spectacular sea views. Cape Rose Cottage has a no children policy so guests are assured of peace and quiet whilst relaxing around the solar heated swimming pool. 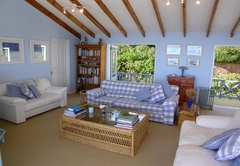 Cape Rose Cottage is situated close to the stunning beaches of Camps Bay, Clifton and Llandudno, and the major tourist attractions of the V&A Waterfront and Table Mountain. 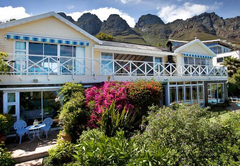 The fishing village of Hout Bay and spectacular Chapman’s Peak are also close by. 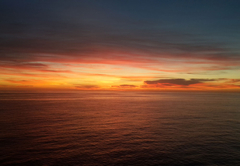 Camps Bay is a trendy resort with excellent restaurants, bars and cafés, as well as its own Theatre. 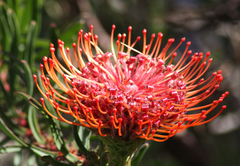 Cape Rose Cottage is centrally located and convenient for exploring the many magnificent sights that Cape Town has to offer. There is off street parking, airport transfers and car hire can be arranged on request. Phone, fax and wireless internet facilities are available. We regret no smoking, no pets or children under the age of 15. 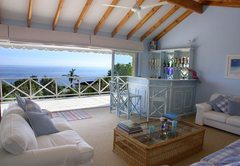 The Penthouse Apartment with panoramic sea views offers 2 suites, with an adjoining lounge. Each suite has a queen size bed, an en-suite bathroom and own kitchenette, air-conditioning, dressing gowns, toiletries, colour TV, ceiling fans and digital safe. The Deluxe Suite with panoramic sea views offers a private balcony, a queen size bed, an en-suite bathroom with bath and shower, a separate kitchenette, air-conditioning, dressing gowns, toiletries, colour TV, ceiling fans and a digital safe. 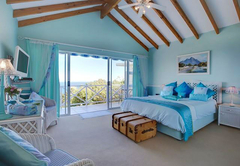 The Deluxe Suite with panoramic ocean views offers a private balcony, a queen size bed, an en-suite bathroom with bath and shower, a separate kitchenette, air-conditioning, dressing gowns, toiletries, colour TV, ceiling fans and a digital safe. 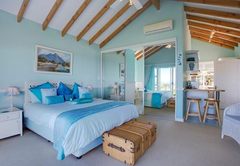 The Deluxe Garden Studio with a sea view offers a private patio and garden area, a queen size bed, an en-suite bathroom with bath and shower, a separate kitchenette, air-conditioning, dressing gowns, toiletries, colour TV, ceiling fans and a digital safe. 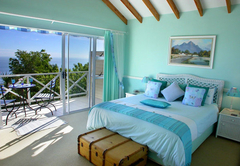 52 Reviews from SA-Venues.com travellers. All reviews are verified. We arrived at Cape Rose Cottage after the overnight flight from London and were met with a very warm welcome from Pam. We were staying in the Lavender Suite which was absolutely beautiful. Every little detail is included in the room, which is furnished to a very high standard. The bed was one of the most comfortable we stayed in during our trip to SA and the bathroom was immaculate. The shower and bath were both great. 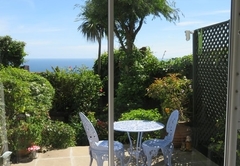 The view from the bedroom is just as you see it on their website, an amazing uninterrupted sea view. 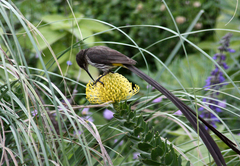 The garden was full of beautiful native flowers and native birds. In fact this cottage was one of the best we stayed in during our 2 weeks in SA and the welcome Steve and Pam provide is second to none. Nothing was too much trouble. They even recommended somewhere to eat in Hermanus where we could enjoy seeing the whales at very close quarters. Pam and Steve both go the extra mile to make your holiday perfect. 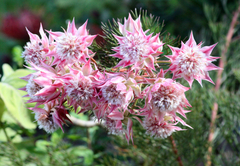 They are perfect hosts and have an idyllic home. 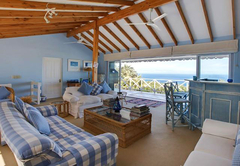 Just returned from our second visit to this stunning guesthouse in Camps Bay - private, quiet with beautiful views ...... On both occasions we stayed in the Aquamarine Suite which is modern, spacious and spotlessly clean. The room was well equipped and nicely furnished with a big bathroom and kitchenette with a well stocked fridge so you can prepare your own breakfast. Hosts Pam and Steve are very welcoming and friendly, always ready to help out with tips on restaurants, activities, maps, directions etc. Even before our holiday they provided advice on car hire and other places to visit whilst in South Africa. The attention to detail in the room was second to none and Pam and Steve have thought of everything you may need including gorgeous toiletries in the bathroom, a first aid kit, iron and ironing board to name just a few. 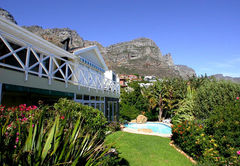 This guesthouse is in the perfect location - close to the stunning beach at Camps Bay and conveniently placed for all the nearby attractions. 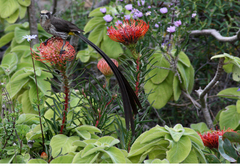 If you are visiting Cape Town look no further! We will definitely be returning. Response timeCape Rose Cottage typically responds to requests in 5-10 minutes.